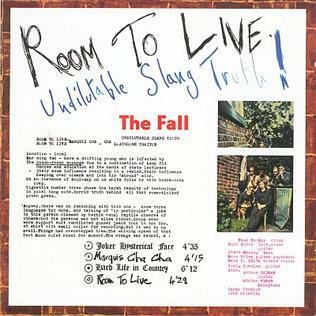 From its brazenly scrawled cover titles to its poloroid photos of the band assassinating benevolent dictator/group leader Mark E. Smith, Room To Live (1982) still seems to me to be the quintessential Fall object. Too short to be a full album and too long to be merely an EP, the seven tracks that make up RTL intentionally challenged the album-tour-album-tour tradition that most bands desperately clung to like a life preserver. As in the previous year's Slates, in RTL, content dictates form. Smith had always rejected the false notion of an album's contents magically cohering by itself, preferring instead to release material as soon as possible in ways that the songs themselves dictated. It was a method that insured that listeners were brought as close to the creative process as possible, the "Undilutable Slang Truth!" that the cover proclaims. The songs on RTL still sound fresh today, still dewy with inspiration. Inspired by "events that hit England around Spring '82," (according to the press release) the tracks take on the Falklands War, TV pundits, and provincial living. In "Hard Life In Country," Smith gets too much room to live and the song ends as the villagers surround his house like the end of a Frankenstein movie. "It's good to live in the country..." Smith, ever the anti-agrarian, moans. "Solicitor In Studio," though, is for me the high point of the record. Slowly gathering steam as it begins, the song lurches into life as Smith declares, "Young dicks make TV! Get 'em away from me!" Proceeding to dissect what Calvin Trillin calls the "Sunday Gasbags," the song becomes a mad dervish carnival machine belching feedback and sarcasm, the mere memory of which actually inspires gooseflesh as I think of it. Coming after the epiphany of Hex Enduction Hour, RTL received something of a critical drubbing and I'm not sure its reputation has ever recovered. RTL's value lies in its relaxed and scattershot approach, its refusal to be a monolithic statement, and its willingness to experiment and possibly fail. Ramshackle, witty, and "undilutable," this was the last gasp of the band as we had come to know them. Marc Riley would soon be gone and the cover versions and picture discs were around the corner. Although I am not one of those who write off the Beggars Banquet years (some of their finest records came out of this period, I think) and although nostalgia is a very dangerous word to use when discussing the merits of The Fall, I know there's a part of me that feels that something wonderful seemed to be lost past this point. Was it too much paranoia creeping in or too many personal crises? There's a brute confidence and joy on this record that's hard to miss-and equally hard to duplicate.